Getting the right nutrients to help safeguard your eyes is necessary now more than ever. Lutein and zeaxanthin are two types of carotenoids that are yellow to red pigments found widely in vegetables and other plants. Along with other natural antioxidants, including vitamin C, beta-carotene and vitamin E, these important pigments help guard the body from damaging effects from free radicals, which are unstable molecules that can destroy cells and play a role in many diseases. What lutein and zeaxanthin does to your eyes is that both carotenoids are deposited in the retina, where they protect your eyes against chronic diseases, age-related macular degeneration, screen and light damage and cataracts. Since your body does produce these crucial carotenoids and you can only receive them from colorful and nutritious fruits and vegetables, it is important to include them in your diet. 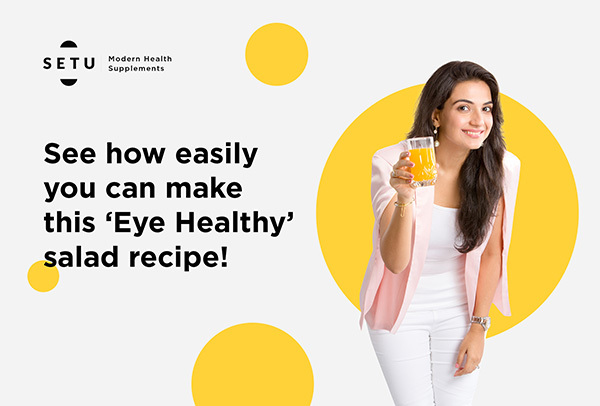 Nutritionist Neha Ranglani, brings you an Eye Healthy salad recipe that you can incorporate into your meals to receive maximum lutein & zeaxanthin. This salad is not only packed with eye nutrients and full of flavor, but it is also super healthy and light. Step 1: Boil the sweet potato with skin until it becomes tender. Once the sweet potato is cool, peel off the skin and chop into small pieces. Step 2: Boil the corn kernels with a pinch of salt in water for about 5 minutes until it becomes tender. Step 3: While the sweet potato and corn kernels are boiling, cut up kale or spinach and red bell pepper finely. Step 4: For the orange soy dressing, squeeze about 2 teaspoons of orange juice and then add about 1½ teaspoon of soy sauce in it and mix it well. You may also grate a little bit of ginger into the sauce to add a zing to the dressing. Step 5: In a large bowl, mix the all the vegetables together, pour the dressing and mix well. Serve immediately. All of the ingredients are packed with lutein and zeaxanthin, kale having the highest amount of it. Kale and spinach also help prevent age related-eye disease while steamed corn kernels, baked sweet potato and red bell-peppers are packed with beta carotene that prevents macular degeneration, dry eyes and night blindness. The orange soy dressing gives a nice zing to the delicious recipe and also helps ‘cool’ the eyes. All you have to do is mix all the ingredients together and mix it well, and voila! Time to eat! Don’t forget that it is important to look away from the screen at regular intervals – at least once every hour. It also helps if you could do a few eye exercises while you’re away from the screen for example by focusing on something in the distance for about 20 seconds. This gives your eyes a chance to change position and relax the eye muscles, ultimately helping ward off eye fatigue and strain. Always remember to make a conscious effort to blink more to keep your eyes moist and hydrated. Adding supplements in your daily diet is crucial because you receive so many benefits that are not possible to get through the food we eat. Setu Eye Max has 20 times more lutein and zeaxanthin than natural foods and also contains bilberry. You can also click the link below to find out more about eye care & eye health.